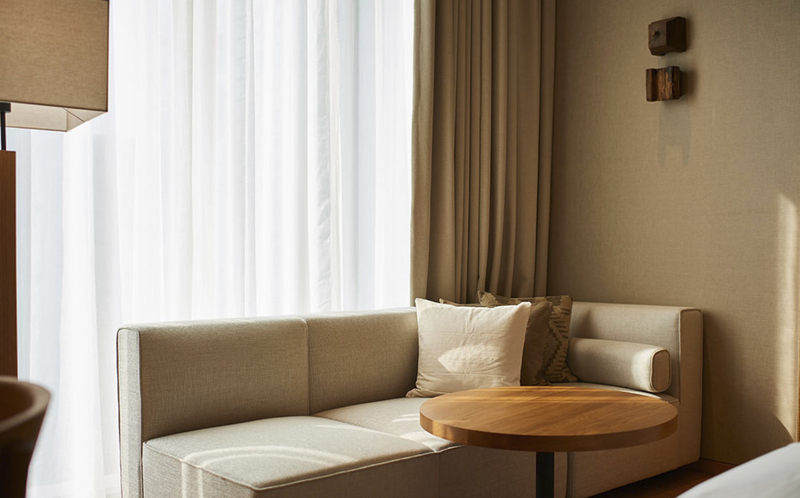 When Muji announced plans to open the Muji Hotel in Shenzhen, fans of the brand were excited to see its minimalist cosy aesthetic put into practice in a true hospitality setting. Walking into the lobby, you get immediately get that sense, with plush carpets, fabric walls, and the occasional cotton flower ikebana in the area. I had just arrived for my stay, with the receptionist explaining, "I have arranged for a ship view room for you, I hope you will like it." I wondered if she meant "a harbour view", though none was in the vicinity of the Upper Hills neighbourhood. Walking past wispy greens and creeping foliage placed against reclaimed wood walls from traditional Chinese homes, I took the lift up to the 5th floor and followed the corridors to my unit. The "ship" turned out to be a wooden fishing boat, installed as a statement piece in the huge courtyard of the hotel. As with all of the other decor pieces around the hotel, it made me feel curious but also a little confused. I had booked into Room Type A at the Muji Hotel. It was only at 950 RMB (approx. S$200) while the highest tier Room Type E goes for 2,500 RMB (approx. S$520). The zen ethos of the company represents itself fully in their pared-down room design. Pale wood floors and fixtures are set out in clean lines, and the fabric-lined walls of the entrance open up to a dramatic porous earthy wall the colour of wet cement. Its 79 rooms will be furnished with Muji's homeware, of course. with room rates for an overnight stay ranging from 950 yuan (S$195) to 2,500 yuan (S$510). Other facilities include a restaurant, library, gym, and meeting room. Muji enthusiasts might be a little disappointed to find the room only has a few of their favourite shop items. There's an alarm clock, a flashlight, the Naoto Fukasawa wall-mounted CD player, and the standard cups and toiletries, but little else. That said, one can borrow classic items from their range, such as their aroma diffuser, air purifier, iron and ironing board, more CDs (in case you're ever sick of hearing the Irish banjo in the background) and mobile chargers. Perhaps the heavyweight (literally) is the thick Muji tome that takes one through the brand's process. If you enjoy reading, you'll be glad that along with a basic gym on the 3rd floor, there's also Muji Books - a library that's open for guests and the paying public to relax in. Choose from 650 titles curated to inspire the creative mind, or take Instagram pictures in the gorgeous space. Pinterest fans take note - there are huge bundles of baby's breath about. 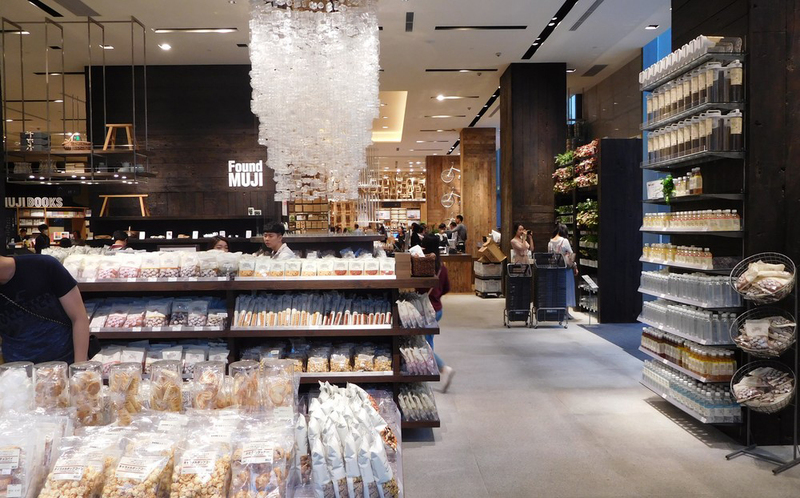 Other than the 79 guests rooms, the compound includes the 118-seater Muji Diner and of course, Muji Retail - China's largest at 1,726 square meters over two levels. The shop showcases the brand's entire inventory, including items not available in Singapore, like bicycles and the hotel's in-room body soap. It also houses a workshop space - because everyone's crafty these days. At Muji Diner hotel guests can enjoy a choice of three kinds of breakfast every morning - Western, Chinese, or Japanese. There's also a side buffet of pastries, fruits, miso soup and curry rice to satiate the ravenous. Locals too, enjoy having their meals within Muji's tasteful decor as well, making the restaurant busy most of the day. The crowd only winds down when the restaurant becomes a bar in the later hours. How "Muji" is the hotel? 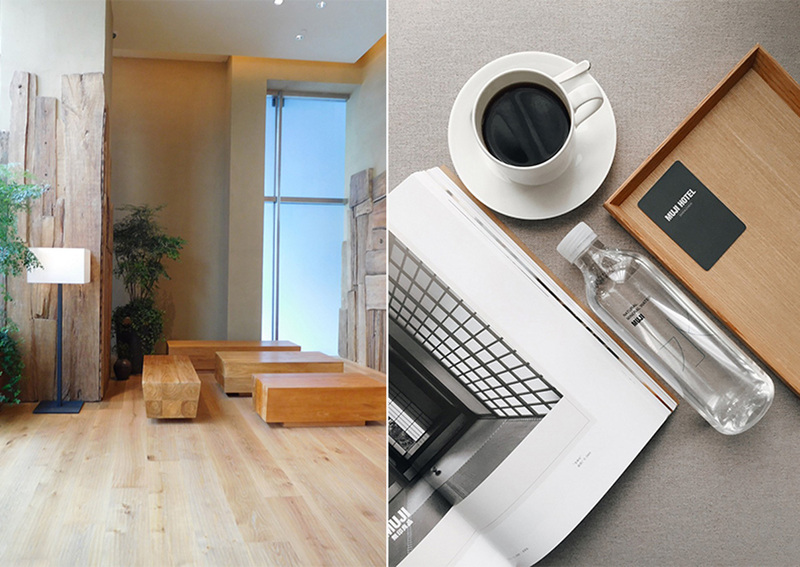 While the hotel's complex is still undergoing construction work, and local drivers may have difficulty finding it, the persistent will be greeted by double Muji signage at the large drive-in foyer, and a well-deserved rest signed off with Muji's signature "minimalist coziness". 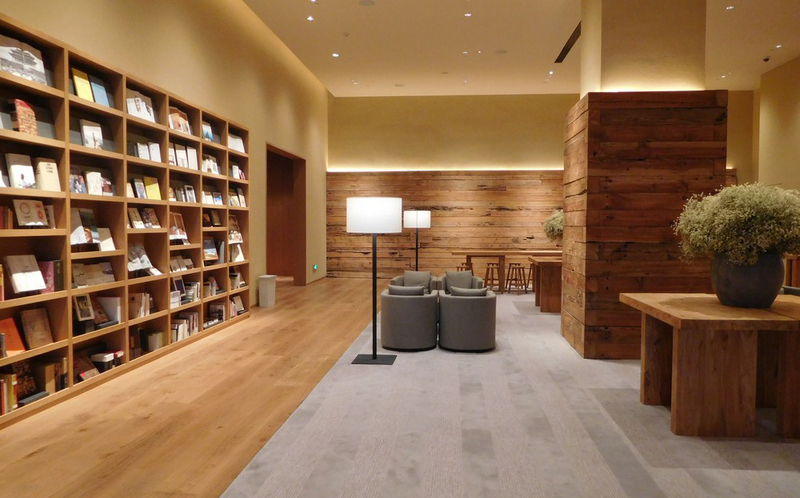 As the welcome booklet proclaims, "At Muji hotel, there are neither exorbitantly-priced and superfluous services, nor dreary guests rooms resulting from the extreme reduction of quality. We have arranged for you both a perfectly priced space in which you will sleep well, restoring both mind and body, as well as services that naturally connect you to the locale."